Weiner, the lively and compassionate portrait of Anthony Weiner, a member of Congress for 7 terms who resigned in 2011 after a tweeting scandal. While he was not associated with one piece of legislation in his Congressional career, he made a lot of noise. He rolled out his rehabilitating run for Mayor with a program to help the middle class in New York City. It sounded like a mantra he worked out with his mentors, Bill and Hillary Clinton. Mrs. Clinton has called Weiner's wife her second daughter. Bill Clinton married Weiner and Huma Abedin. Many of us moaned "poor Huma" when Weiner was caught. This film makes clear that she is a complicitous politician who makes her own bed. Weiner apparently agreed to let his former Congressional chief of staff Josh Kriegman shoot his campaign because he wanted to present a more rounded picture of himself. Rounded it may be, but it does not reveal Weiner. One moment when he muses about the reason people who are attracted to politics are also attracted to the new social media digs a bit into his compulsive tweeting of his personal parts. He senses that anonymous interactions and continuous attention are the pleasures of both pollticians and tweeters. Anyone who has spent time with teenagers knows that no matter how much you warn them about the dangers of drugs and drink, they end up with the insight that this applies to others, but never to them. Politicians seem to suffer from the same "but not me." After Gary Hart was caught with Donna Rice no politician was safe. Bill Clinton of course followed suit in the Oval Office. Mrs. Clinton, fully aware that government business was to be conducted on government websites set up her own account on a foundation server that was compromised by the personal emails of her husband and daughter. The laws say you can't do this. Mrs. Clinton said, 'but not me.' Insights into this process might change this fallacious thinking. To blame the press in the internet age is ridiculous. The portrait of Weiner's wife is unintentionally more revealing. A woman who started out carrying Mrs. Clinton's purse has become co-chair of her 2016 campaign. She has developed the elephant's hide Mrs. Clinton advocates. Abedin is funny and tough and clearly follows the Clinton path, stick with your man no matter what. Are politicians retro? Director Josh Kriegman says that he mostly likes Weiner, and for this reason, we do too. The camera and crew were respectful, and if the Weiners asked them to leave a scene they did. Kriegman did not discuss which scenes we missed, although he did say that much funny interplay between the director and the Mayoral aspirant landed up on the cutting room floor. 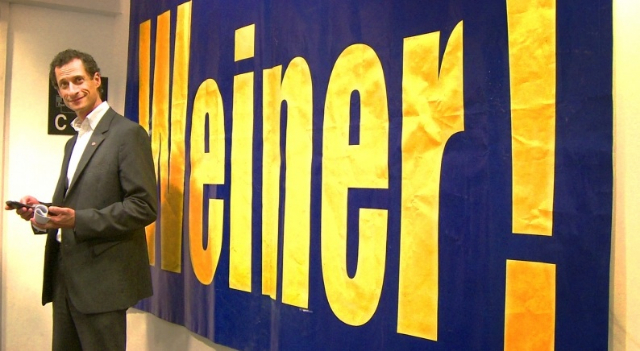 Have we missed out on a promising politician with the demise of Weiner? The film does not suggest this. In the current political season, new politicians have emerged on the national scene. 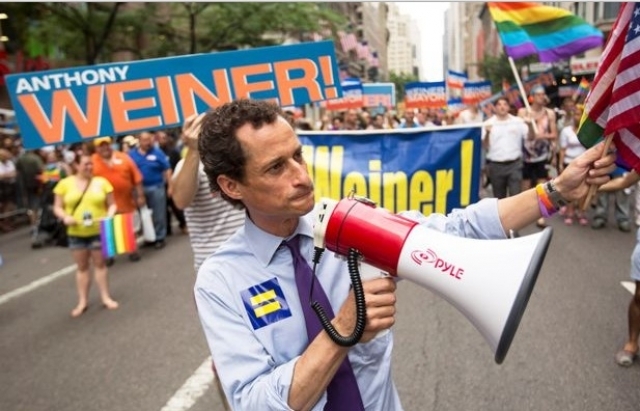 Curiously none are as foul-mouthed as Weiner, and that's saying a lot.